context :: how does your city affect you? how does your city affect you? In Fall 2005, Art Interactive is conducting a nine-week-long experiment. We have invited artists affiliated with Glowlab, a network of psychogeographers, to use the Central Square neighborhood as the site of their research and fill the exhibition space with the results of their investigations. PSYCHOGEOGRAPHY, a term coined by the Situationist International in the 1950s and appropriated by contemporary artists, is used to describe projects that produce affect in relation to the geographic environment. Rather than making maps in the traditional geographic sense, these artists utilize maps and geography to conduct located experiments with (among other things) people, trash, bikes, clothes, the sky and the gallery space itself. Often making use of mobile technologies and existing in the hybrid spaces of the Internet and the physical world, their projects produce new understandings of location and identity as shifting, fluid, singular and irreducible. 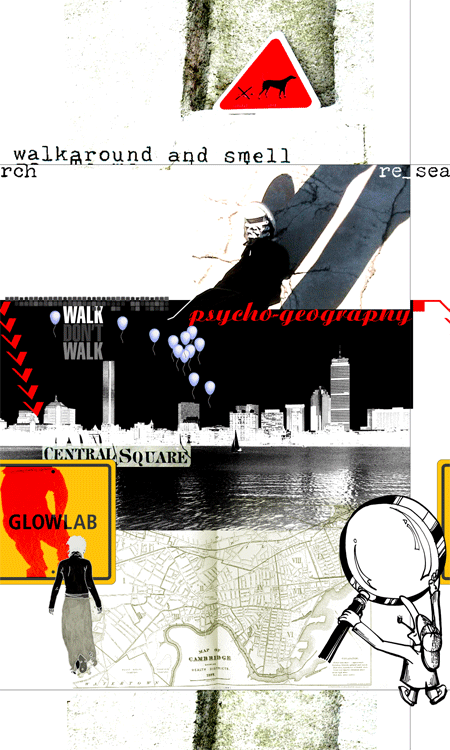 Glowlab, a Brooklyn-based psychogeography network presents Open Lab at Art Interactive. During this festival and exhibition curated by Christina Ray, more than twenty artists will research the effects of the urban environment on emotion and behavior by leading a series of public events. Each weekend of this unique festival and exhibition, several Glowlab artists will be "in-residence" at Art Interactive to lead interactive public events in the neighborhood. These include a wearable trash workshop, a laughing bike tour, a lesson in text-messaging the sky, and an informal conversation with a suitcase.